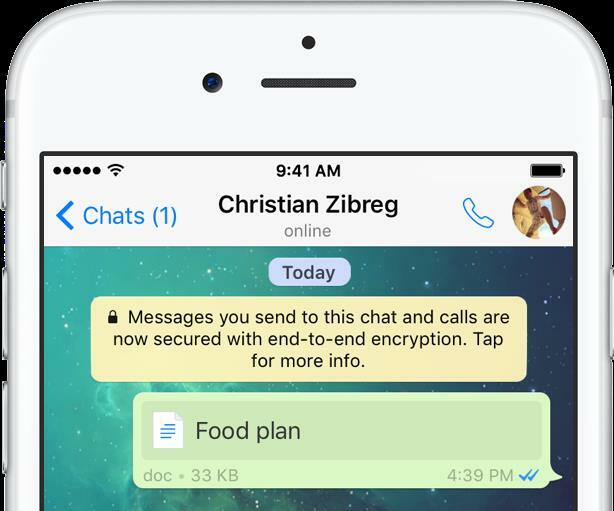 After enabling complete end-to-end encryption for chats and adding support for sending and receiving PDFs and basic text styling, WhatsApp for iPhone in its most recent update brings the ability to attach Microsoft Office documents to your instant exchanges with friends on the service. Although not mentioned in the official release notes accompanying the 59.1-megabyte app, the change was spotted this morning by the Italian blog iSpazio. This is a useful new feature for users that removes the need to convert Microsoft Word, Excel and PowerPoint documents to the PDF format before attaching them to their WhatsApp conversations. To attach an Office document to your message, tap the icon resembling a circle with an up arrow inside, it’s on the leftmost side of the text entry field. In the pop-up menu, select the Share Document option. Another menu pops up, inviting you to choose among Document Provider extensions installed on your device. I want to attach a Word document in my iCloud Drive so I’m going to tap that option. Using the iCloud Drive document picker, I navigate to my Documents folder on iCloud Drive and tap a Word file. A few seconds later (the file needs to be downloaded from iCloud), WhatsApp asks me to confirm that I really wish to send the file to the contact. Just tap Send and you’re done. The recipient will see an inline document icon in the chat. They can tap the icon to open the file using iOS’s system-wide file viewer. From there, using the Share sheet, the Office file can be opened in Pages, Keynote, Numbers or in Microsoft’s own Office apps (if installed) or sent to other apps and services. Pretty neat, wouldn’t you agree? In fact, in my testing this feature now works with any standard file type that iOS supports out of the box. WhatsApp requires an iPhone, iPod touch or iPad with iOS 6.0 or later. The app lacks a native interface on iPads and doesn’t have a native watchOS app for the Apple Watch. WhatsApp is localized in English, Arabic, Catalan, Croatian, Czech, Danish, Dutch, Finnish, French, German, Greek, Hebrew, Hungarian, Indonesian, Italian, Japanese, Korean, Malay, Norwegian Bokmål, Polish, Portuguese, Romanian, Russian, Simplified Chinese, Slovak, Spanish, Swedish, Thai, Traditional Chinese, Turkish, Ukrainian and Vietnamese. Grab WhatsApp at no charge in the App Store.